5/28/2008Share this story on Facebook! The Department of English offers courses in English literature, American literature, African American and ethnic literatures, dramatic literature, poetry, autobiography, science fiction, detective novels, critical theory, and a great deal more. In a funny coincidence, Professor Michael Twomey, Dana Professor of Humanities and Arts at Ithaca College, has unearthed an unknown piece of Arthurian literature, while his former student Steven Hartman ’87 announced that he had discovered a letter written by Henry David Thoreau to Ralph Waldo Emerson. 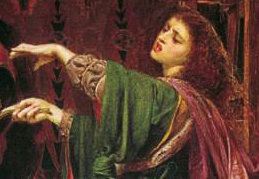 Professor Twomey discovered a previously unknown text, written as a letter, in which the fictional character Morgan le Fay speaks satirically about Piers Gaveston, the alleged lover of England's King Edward II. The letter was written in the medieval French of England. In the letter, Gaveston tries to jump to the moon but fails. It was meant to be a warning to those in power that hubris could be their downfall. The manuscript was previously catalogued in the British Library in London, and was probably received by the crown as a settlement of debt in the early 17th century. "The discovery was accidental," said Dr. Twomey. "At the moment I'm trying to establish who might have written it, and I've narrowed the possibilities down to the clerks working in the households of the so-called Ordainers -- the powerful earls who banded together to pass the Ordinances of 1311 that limited Edward II's power over them." The letter will be published in the journal Arthurian Literature. Hartman’s discovery of the Thoreau letter, which was previously thought to be destroyed, was made in the National Library of Sweden. It is the only Thoreau letter that can now be found in a special collection outside of the United States. Hartman discovered it in a volume of Thoreau's writings owned by the library. Written when Thoreau was living in Staten Island, New York, the letter is to fellow transcendentalist Ralph Waldo Emerson and discusses Thoreau's feelings about life in New York in the 1840s.